This is a stepped gear machine with a full keyboard. 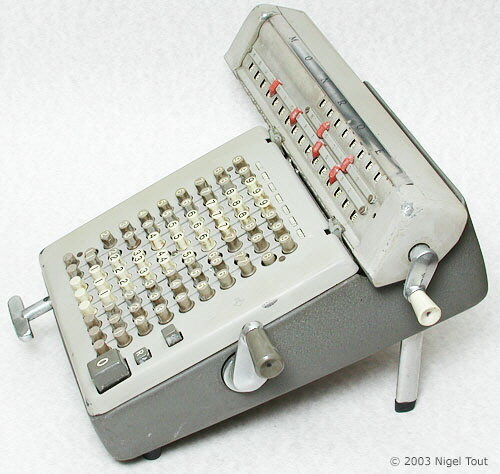 8-decade keyboard, 16-decade total, 8-decade counter. This machine was made in Holland, but others were made at the headquarters at Orange, New Jersey, U.S.A. The operating manual with this machine was printed in 1958. 300 x 253 x 48 mm (11.8 x 10.0 x 1.9"), 3.5 Kg (7.75 lbs). Designed by Frank Baldwin, the first Monroe machine was marketed in 1911 and gradually evolved over the years, including electrically driven models. They combine the crank-driven stepped-gear mechanism with a full-keyboard, which gives fast setting of numbers combined with rapid calculation. Numbers are set on the keyboard. Pressing a key moves a mechanism to engage the number of teeth on a stepped gear corresponding with the number printed on that key. 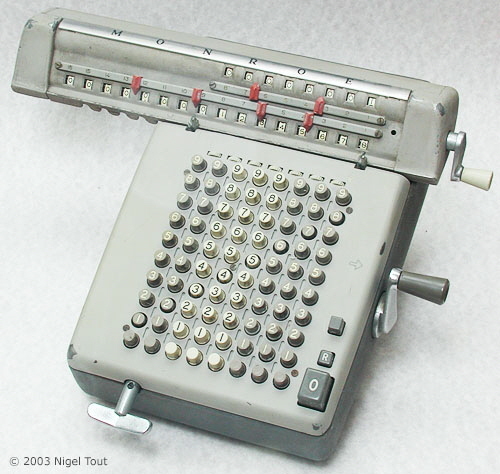 Then turning the grey-handled crank on the right one way adds the set number to the accumulator register (the row of windows second from the top), and turning the crank the other way subtracts the set number from the accumulator. The crank can be turned multiple times for multiplication and division. The top row of windows counts the turns of the crank. The handle on the left of the front moves the carriage in order to perform multiplication or division operations on the different decades. The rear legs fold down to support the machine at a more comfortable angle for use. 'Operating Instructions: Hand Operated LN models', (English, pdf). 'Bedienungsanweisung: Hand- und elektrische "L" Modelle' ['Operating Instructions: hand- and electric models'], (German, pdf). 'Mechanical Functioning (Disassembling - Reassembling - Adjustments - Lubrication): Models L 160-X and L 200-X', (English pdf).